RunnersOnTheGo.com – Page 9 – To help enrich the lives of others, we developed RunnersOnTheGo.com to help runners save money on races, running stores, and much more. We also provide the specific local information that makes your travel for business, vacation, or racing as rewarding as possible. 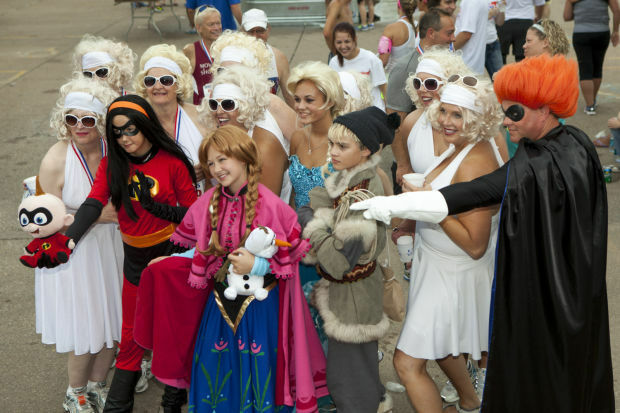 The Quad-City Times Bix 7 Miler in Davenport IA, is a road running tradition in the U.S. With over 10,000 finishers in the 2014 race, this race is larger than most Marathons. I was lucky enough to run in the 40th version of the race this year. Writing race reviews is an interesting practice. I have raced all over the U.S. in different types of events and in different sizes of road races. I have run races like the Houston Marathon and Lilac Bloomsday run with tens of thousands of finishers, and I have run races with 30 people standing around at the starting line. In my experience I can generally break races up into 4 categories. Very small: usually a few hundred runners at most. Of course this is more of a continuum than direct categorization, for example the Bix 7 (10,000 runners) experience is nothing like the Boston Marathon (35,000 runners.) However, the point is that it is not necessarily fair to compare races directly. A race like the Bryce Canyon Half Marathon (about 1,200 runners) is going to be graded with different criteria in mind than the Bix 7. For example, one of the primary grading criteria for any race is the expo/packet pickup. In many small races you walk into the local running store pickup your packet, browse a little, and walk out. Medium size races usually have some kind of hotel or conference room reserved because of the needed space. At any large race you can expect a full-blown expo. However, the concept of the size of a race being on a continuum comes into play in the quality of the race expo. 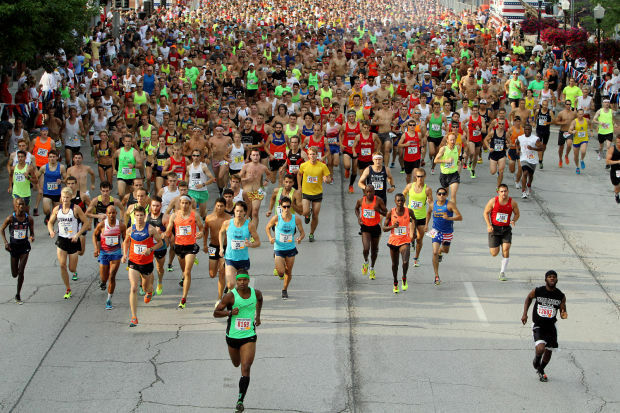 The Bix 7 had a full blown expo, however, it was nothing compared to the Houston Marathon, and Half-Marathon. This is understandable though considering the difference in size between the two races. The packet pickup was extremely organized and I had my packet in hand in less than 5 minutes. The only thing I noticed was a lack of “swag” in the swag bag (there wasn’t really any free stuff in the packet.) Of course, the swag bag is never the reason anyone runs a race, but it is always nice to get some free stuff. 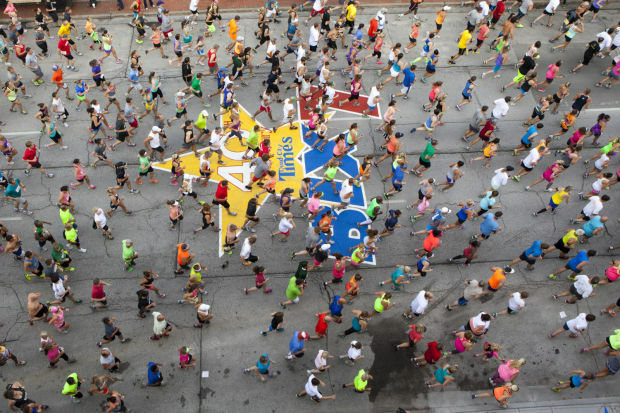 The Bix 7 played host to the US road 7 Mile Championships this year, which will, I imagine bring a different feel to the race than in other years. For starters, the elite field was composed, primarily, of American citizens (not exactly the standard practice for the Bix 7.) This brings an interesting dynamic not only to the elite field, but to the race as a whole. At a race with 10,000 runners there will be a lot of serious and semi-serious runners who are not elite. Having most of the professionals be American, and hosting the U.S. championships created an environment where the general participants could relate to the awards ceremony, and interact with the top finishers. It made the race at the front much more interesting to the people who weren’t actually involved in the race at the front. I think this is especially true because of the course. The start of the race has plenty of warmup area, but, at least in the area I was in, an abundant lack of bathrooms. It is rare that a race actually has enough bathrooms, but I waited in line for about 20-25 minutes. After they bring all athletes to the starting line, there is an air-force flyover, the singing of the national anthem, and presentation of flags, along with a LOT of announcements. The patriotism was great, but when people warmup for a race, they don’t want to stand around for 5 minutes cooling down. I think the race directors could benefit from a bit more brevity. That being said, I have helped put on a race and I know what an emotional and relieving experience it is when it actually goes off, thus I have a bit of understanding for all of the announcements thanking this person and that person. 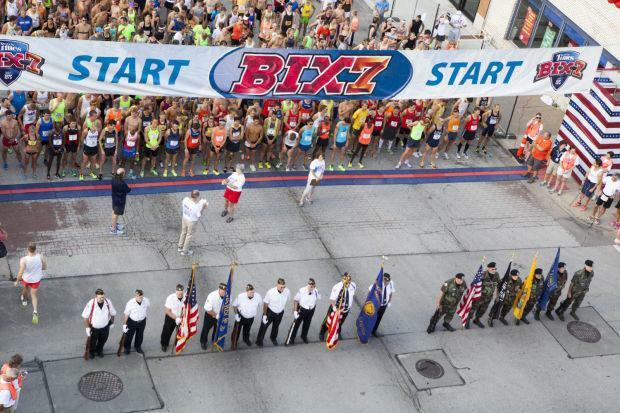 The course for the Bix 7 is an out and back. LITERALLY an out and back. There is about an extra half-mile when you cross the starting line until you hit the finish line at the end, but other than that, you follow exactly the same route back as you did out. This is another unique and fun feature of the race. I mentioned before the connection between the casual participant and the elite field. I think a big part of that connection is the fact that the casual participant has the best view of the race. They get to see the top guys go by, then they see how far back the guy like me is (I got 20th overall, not my best race.) They get to see the first woman and how that race is playing out. They literally get to watch the race at every level from elite, to emerging-elite, to local-elite, sub elite, etc. It is exciting for the participant/spectators, and it is exciting for the competitors. The other major feature of the course is that it is one big hill. You start at the base of Brady Street hill which is just over 1/4 mile long and pretty dang steep (I think it probably looks more steep as you are standing at the base of it, staring up, about to start a 7 mile race.) I will say that I would rather have it at the beginning than the end, but it definitely makes for a somewhat technical course, because you have to decide whether to go after the hill that is right at the beginning of the race, or stay conservative. I elected to stay conservative. I am not sure it was the best choice. At the top of the hill is a half-mile of the only flat section of the course and then you hit a long gradual downhill of varying degrees for another mile and a half. The last mile on the way out and the first mile on the back is 3-5 rolling hills, some of them very steep, some gradual, none that are all that long. Then you ascend a mile and a half, and hit the flat. By the time you get back to Brady Street hill at mile 6, you are grateful for the downhill, because you are pretty well spent from all the climbing on the way back. Even still though, the last mile is a screamer. If you are on pr pace with a mile to go, you will most definitely hit it. Think of this race as a 10k, because the hill and some adrenaline will carry you the remaining 3/4 of a mile. Finally there are 3-4 musicians and/or bands stationed throughout the course. This is always an interesting feature of a race. It can either be exciting or motivating, or aggravating if you are tired and the band is playing a song you don’t like. I had a somewhat upsetting finish, however, I was in the first handful of people to finish. The only complaint I have about the post finish area is that the racers are guided like cattle quite a distance from the finish line, if I had to guess I would say it is between 1/4 mile and 1/2 mile. The post finish area contains your pretty standard foods, chocolate milk, fruit, peanut butter crackers, water, gatorade, etc. The finish area is a general party, but nothing out of the ordinary, in fact much of it is on black top that is continually heating up as the day goes on, however, it is complete with a massage tent, which is always a nice feature. Some friends of mine were in the top 10 and I stuck around for the awards ceremony and took some pictures. One unique feature of the awards ceremony was that the top finishers got real trumpets mounted on a plaque, and by real, I mean playable (the top female tested it.) The city of Davenport has strong ties to Jazz music and this is a nice tie in. 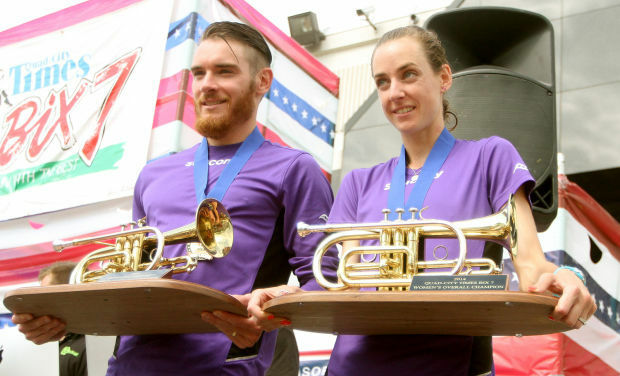 Sean Quigley and Molly Huddle hold up the victory trumpets. One thing to remember at this race, or any other race of this size, is to remember to make arrangements with your family as to where and when you will meet after the race, and be sure to include your phone in your drop bag. Also, keep in mind that there may be added security measures since the Boston bombings. Overall I give this race a “B.” It is a solid race and could easily get an “A” depending on the preference of the writer, but I try to be as impartial as possible. I think there are some things that could be improved. Mainly the packets, some added energy at the expo, more bathrooms at the starting area, and less time standing at the starting line. Overall, these are small details, the organization is great, and I guarantee this race would be a great experience for any runner looking for something outside of his or her norm. Perhaps Mekhissi-Benabbad would have received a little more mercy if he did not have a history of creating trouble. After winning the European Championships Steeplechase in 2012 Mekhissi-Benabbad walked up to the mascot and shoved it. The person inside the mascot costume was a 14-year-old girl. Mekhissi-Benabbad’s hate of mascots can be traced even further back though. In 2010 after winning his first European Championship in the Steeplechase he asked the mascot to get down on his knees, and then shoved him. Admittedly the first mascot shoving in 2010 looks like a joke. The one in 2012 looks a little bit angrier, but let’s give him the benefit of the doubt and say it was a follow up joke. He certainly wasn’t joking in 2011 when he got into a fist fight with fellow countryman Mehdi Baala. To make matters interesting, this guy isn’t some mid-level guy working the circuit. He has medals . . . a lot of them. He earned a Silver Medal in the 2008 Olympics in the Steeplechase and followed that up with another Silver in 2012. He also won Bronze in the 2011 World Championships as well as the 2013 World Championships. Mekhissi-Benabbad boasts pr’s of 8:00 in the 3000 Meter Steeplechase and 3:33 in the 1500. He seems to be the only man who can break up Kenyan dominance in the steeplechase. 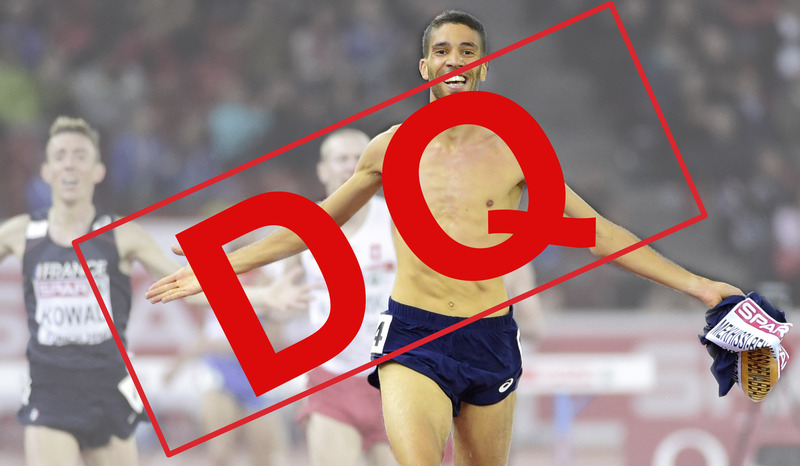 Mekhissi-Benabbad removed his shirt before the last barrier and put it in his mouth so that he would have both hands free to excite the crowd. Perhaps it is possible that Mekhissi-Benabbad is using the fact that he is fast to justify his outrageous behavior. Track and Field is different in Europe than it is in the United States, and being a good Track and Field athlete is actually somewhat famous there. Of course, they are nowhere near being Soccer stars, but there are actually fans of the sport in Europe. This type of behavior likely gives Mekhissi-Benabbad a higher profile there. being stripped of his gold is certainly a punishment, however, one has to wonder if the increase in fame that has likely occurred from his behavior has not reinforced it. After the race, Mekhissi-Benabbad’s countrymen Yoann Kowal, who was awarded the Gold Medal upon Mekhissi-Benabbad’s disqualification stated that he didn’t think that Mekhissi-Benabbad had done anything wrong. However, there is a phenomenon that is sometimes observed in basketball wherein a player that is well-known for dirty play gets called for a foul that they didn’t commit because of all the times they have committed it before. In other words, they don’t get the benefit of the doubt. Perhaps that is what happened with Mekhissi-Benabbad in this situation, and perhaps it is a good thing. A supporter of Mekhissi-Benabbad might explain the mascot attacks as a joke and defend him by saying that Mehdi Baala started the fist fight. However, this guy seems to find himself as the center of controversy (and subsequently the center of attention) quite often. Perhaps he has a personality type that attracts controversy. Want to save money when trying to prevent or cure running injuries? RunnersOnTheGo.com is partnering with a variety of clinics including chiropractic, physical therapy, and massage therapy. The clinics offer significant discounts to members of RunnersOnTheGo.com and they love to treat endurance athletes. Most are in Utah, although you will find a few outside of Utah including the San Diego Running Institute, who even offers a Computerized Gait Analysis to analyze your running form and see where you might be going wrong. -Experience the Difference Therapeutic Bodywork & Massage in Provo. -Canyon View Chiropractic Wellness in Salt Lake. -VAST Chiropractic, Inc in Salt Lake. They offer 50% off all services to RunnersOnTheGo Members all year long. -60-minute massage, chiropractic adjustment, 20-ART session, and NormaTec Compression Treatment. Just $69. More than 50% off regular price. Appointment must be scheduled before July 31st. All you have to do to take advantage of those discounts is become a Member of RunnersOnTheGo.com by purchasing the Member Card. Then show your card at the time of purchase and you will receive the discount. The card will not only give you discounts to these places but to many more races, running stores, and more. You can purchase the card for just $20 and often make up your money in one single use. Not sure if you want to purchase the card…sign up for our email newsletter to see what types of discounts we offer. You can sign up for the newsletter on the RunnersOnTheGo.com Home Page. You will receive info about exclusive deals being offered to Cardholders as well as interesting running reviews. The finish line area of the Divina Pastora Marathon in Valencia, Spain! Running on water? Not really, but the start and finish lines of the Valencia, Spain Divina Pastora Marathon make you think you are. There’s more than a cool start and finish to attract runners from around the world to Valencia on the third Sunday in November. This year the weather was cold and windy on Friday when we went to the Expo at the complex of buildings near the finish line where the Opera House is located. But on Sunday, the temps moved up to the low 60’s and it was a great day to run. Running kilometers instead of miles is a real difference and seemed to enhance the experience of running in an interesting foreign city. Among the memorable sights along the course were the America’s Cup Port and the beach along the Mediterranean, the University of Valencia, the Royal Gardens, and the Plaza de Toros. Water stops? They were pretty much like in the U.S., except that hardly anyone spoke English, and being given dried apricots during the later miles was an unexpected treat. Crowd support was great and spectators yell your name on your race bib when you pass by from start to finish. ENGLEWOOD, CO, June 30, 2014 – NASA Astronaut Steve Swanson is officially registered with a 6-person ultra team to compete in the Wild West Relay which takes place August 1st and 2nd in Colorado. He will join the competition from the International Space Station where he is currently in orbit. The race is a 200-mile relay originating in Fort Collins and ending in Steamboat Springs. Swanson has completed the Wild West Relay Race twice before as a participant. To participate, Swanson will be strapped onto a treadmill on the International Space Station where he will run his six relay legs for his team at his designated times. The team is hoping to be in communication with Swanson during the race to notify him when to start running, and for him to notify his team when the next runner should start when each of his legs is completed. Swanson will compete on a six person ultra-team (each runner averages 33 miles) with the team200 Miles, 20 Orbits and 90 Schillings. The name of the team represents the number of miles of the relay, the expected number of orbits that will be made during the course of the relay and the team’s favorite beverage. The captain of the team is Bredt Eggleston of Fort Collins, a friend of Swanson’s and previous participant in the relay. Other astronauts are expected to be part of the team, including Sunita “Suni” Williams, who participated in the Boston Marathon in 2007 by running her marathon on the Space Station. 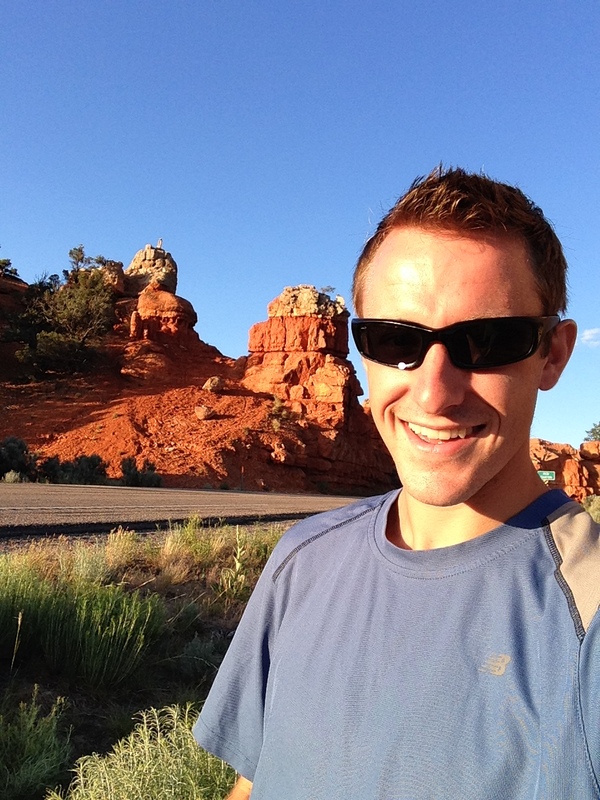 Swanson is originally from Steamboat Springs and attended the University of Colorado, Boulder. He is currently two months into a six month mission on the International Space Station. August 1-2, the Wild West Relay will cover 200 miles from Fort Collins to Steamboat Springs. Runners compete on a 12-person or a 6-person ultra team through foothills, open spaces, and back roads, passing through three National Forests and crossing two mountain passes. The race finishes at the Steamboat Springs Ski Resort. More information available at www.rltrelays.com. Furthermore, RunnersOnTheGo.com Members receive a discount to the relay. Each runner who owns a card can receive $10 off their respective race cost. Roads Less Traveled Relays are staged by Timberline Events LLC, a Colorado owned company. The races benefit Volunteers with a Purpose, Inc. (www.VolunteersWithAPurpose.org; which benefits non-profits in the communities that races pass through – over $250,000 raised and distributed), and 1% For the Planet. I made the long drive from Idaho Falls, ID to Cannonville Ut. On July 11th. 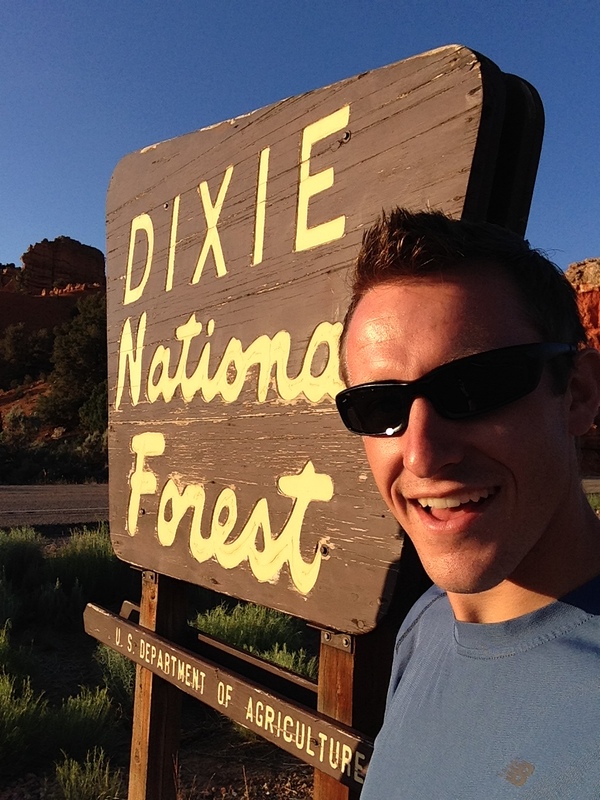 Along the way, I picked up Wasatch Running Center athlete Brett Hales. We had made a plan in advance to split the gas and camp out at the finish line the night before. A little further east at the beginning of Bryce National Park: Ok, this drive is getting really boring-WHOA! This just got amazing. The entrance of Bryce Canyon National Park hits you like a ton of bricks. after spending about 3 hours being bored to death by flat, ugly desserts, you pretty much turn a corner and see beautiful red rocks, arches that go over the road, and vast green forrest. I am not much for pictures (especially selfies with other guys) but we had to get out and take in the scenery. In my opinion one of the best parts about the race is that, at least in the direction we were coming from, we had to drive the entire course to get to Cannonville, where packet pickup was. In my experience, I race a lot better when I know the course beforehand. it also increa ses the altitude, but I digress. This course put every other Utah Course I have been on to shame. The start line is at about 7,500 feet above sea level (the air is thin up there) and finishes at 6,000 feet above sea level. To give you a general idea, most of the large half-marathon’s in Utah like the Top of Utah half-marathon, and the Utah Valley half-marathon have around 600-800 feet of elevation loss. That is less than half of Bryce Canyon. Brett and I picked up our packets did a quick shakeout jog and hit the sack (by hit the sack, I mean we literally hit the sack, we camped in the lawn of a church that was close to the bus pickup area.) Quick anecdote from our open air camp. After we talked for a bit we settled into sleep until about midnight when someone set off a series of professional grade bottle rockets. This is a town small enough to throw a rock from one side to the other with a few hundred sleeping runners. Looking back on it, it was a pretty funny prank . . . I did not have that thought at the time. Race morning was the standard: wake up at early o’clock, get on a bus to the start line, stand around a bunch of fire pits like you are in some kind of prison camp, jog a little bit and wonder how it can possibly be so cold in the middle of July, take off your warmups and freeze for a few minutes, wonder why you ever agreed to something like this . . .
Then the gun goes off. I am a bit of a novice when it comes to road racing. At this point I am just over a year removed from college Track where the longest distance is 10k . . . and that was too long for me. On the track the gun gives you a burst of adrenaline, you jockey for position, then you do your best to settle in, being careful not to relax too much because your race is only going to last a few minutes. I have learned that the roads are not like this. After taking a few power steps off the line, I reminded myself that there was still over an hour of race left, then I proceeded to try and relax as much as possible. Brett and I had an agreement that we would run through 6-8 miles together as relaxed as possible. Brett was content to split the first and second place prize earnings between us, but I was thinking about trying to run a pr. I was still unsure what I would do after the halfway point. Brett did the early pace work. the first mile is flat, cold, and at a very high elevation. We came through in a fairly relaxed5:24, in the second mile our legs started to warm up some and we got a little bit of downhill right at the end, 5:10. When we looked around at the starting line, we didn’t recognize anybody, so we expected it to be just the two of us pretty early in the race. However at the 2-mile mark we had one more runner sticking with us. I know Brett’s M.O. is to try and create a gap early in the race and then coast to victory. True to form, I felt the third mile pick up. to be fair, the third mile was by far the most elevation loss of any mile in the course, and there was a lot of downhill throughout the whole race. That being said we came through the 3rd mile in a nice conservative 4:30. Needless to say we dropped our tail. After the surge we settled into a few more miles hovering around 5:00 pace. We came through 5 miles in about 25:10. After five miles I started to feel it a little bit, but it would come and go. There would be a few hundred meters where I thought I felt pretty tired for how early in the race it was, then that feeling would pass and I would start to feel like I wanted to pick up the pace. In the back of my head throughout the whole race was how absolutely beautiful the course was. you spend miles 3-10 dropping down a canyon that overlooks miles of red rock and forrest. It was a perfect day, the perfect time of day. If I wasn’t in the middle of a rather painful endeavor, it would have been a little slice of paradise. Another thing that happened around mile five was that I started to form a blister. six miles in, I made the decision not to chase that pr down just yet. I would stick with Brett for awhile and if I was feeling good enough a little later, I would go for it. Ironically that was about the point where any chance of a PR went out the window. for miles six through ten we went from hovering around 5:00/mile pace to hovering around 5:15/mile pace with some miles in the 5:20‘s. However, about 7 miles in I started having more sections where I struggled than ones where I felt good, so I was OK with the slower pace. At mile 9 I made my first ever attempt to take any type of fluid during a race. I grabbed a water cup at the aid station and crimped the top like I had been fought. I then proceeded to try and drink some of the water while the water proceeded to go everywhere but in my mouth. I continued to muscle through mile eleven while Brett cruised. shortly after the twelve mile mark Brett said that he was Ok with splitting the 1st and 2nd place prize purse. I was a little surprised that he waited this long to bring it up, because, if there is a chance that I could beat Brett in a half-marathon, it would be in a race that came down to the last mile. However, knowing there were definite points where he could have established a lead on me I agreed, and we ran in together running about 1:07:30. Overall I was fairly pleased with the effort. It was my second best half-marathon ever. I was however, a little surprised. My PR in the distance is 1:06:10 at the Top of Utah half-marathon last year, and that was my first half-marathon ever. In fact, that race didn’t even feel that hard. I was surprised that I worked much harder on a course with almost 3 times more downhill and ran over a minute slower. I think it was a good indicator that I need more experience at the longer race distances. The race had a fairly simple finish line, but it was perfect. they had all of the essentials, chocolate milk, bagels, fruit, a big park with plenty of shade and lots of space, and a prompt awards ceremony. In all I give the Bryce Canyon Half Marathon an A+. This race is a gem, it seems small and quaint, but it has great organization and a course that is hard to beat. Postnote: The blister I started developing around mile 5 grew into a monster. It took up about 1/3 of my left foot and was all kind of weird colors. I could barely walk for the rest of the weekend. Some destinations surpass our expectations for good running and travel experiences. Ottawa ON certainly fits into that category. Before going on a family vacation trip that included a stop at Ottawa I’d never heard of the Rideau Canal. Now I’m happy to say that I know it well. The canal is the place to be when you visit Ottawa, judging from the number of runners and cyclists I saw. There are wide, well-maintained paths on both sides of the canal as it winds through the downtown of Ottawa. There are interesting views of the city and plenty of grass and trees along the way to make this the most welcoming of urban running areas. As you run, you’re accompanied by boats of all types, including canoes and kayaks, and even stand up paddle boarders. A quick note: for anyone thinking of traveling to Ottawa in the winter, be sure to bring your skates. The Canal has the title of the world’s largest skating rink; it’s almost 5 miles long . Last year there were 71 days of skating, with 1,200,000 visits to the canal—along the same route runners and cyclists use in warmer weather. definitely an interesting conclusion to your run. There I encountered two kayakers on an 8-day 180 mile trip from Kingston, on Lake Ontario, the north end of the canal. One has run Boston twice and made me a believer in the great opportunities to enjoy endurance sports in Canada. 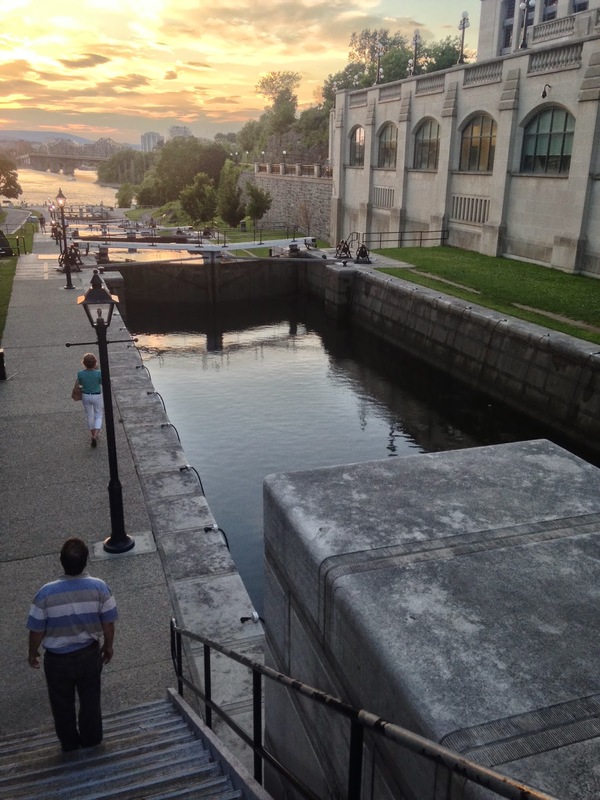 The canal is an important part of the highlight of the running year in Ottawa—the Ottawa Race Weekend that will be held on May 23-24, 2015, http://www.runottawa.ca. The marathon start and finish are on the Canal, and runners get to enjoy the path twice during the run. There’s also a half mar athon, 10K, 5K, 2K and kids race. Last year 47,500 runners competed in the six events during the weekend. Once you’re done with your run, take some time to walk along Parliament Hill to see the very impressive Parliament and government buildings that appear to be straight out of old England and are surprisingly accessible. Be sure to walk up behind the buildings to see the spectacular view of the Ottawa River. Maybe even take in the changing of the guard if you want to play tourist. If you need some new running shoes or other gear, make your way up Bank St. to the Glebe neighborhood and stop in the Running Room, www.runningroom.com, 613-233-5617. You’ll need to take a cab if you’re staying downtown and are not with a car. Speaking of downtown Ottawa, there are quite a number of good hotels within walking distance of the government and the canal. At breakfast, you may even encounter a foreign government official in town for an important meeting. Also, before you travel, check out Ottawa’s schedule of festivals—it seems there’s one for every interest. When I was there, we wandered over to Confederation Park to catch part of the Jazz Festival. My suggestion: add Ottawa to your list of places to visit and to run.